Athens Mayor Dora Bakoyannis, widely praised for helping tidy up Greece's crowded capital before the 2004 Olympic Games, won this year's World Mayor Award, organizer of the competition announced Monday. The 51-year-old Bakoyannis, the city's first female mayor and daughter of Greece's former prime minister, was named winner in anannual competition by the London-based City Mayors Organization. She was short-listed among 65 of her counterparts from across the globe, including Mayors Veltroni of Rome, Livingstone of London, Delanoe of Paris, and Wowereit of Berlin after over 550 mayors from Asia, Africa, Europe and the US were nominated for World Mayor 2005, the Athens municipality said in a statement. More than 87,000 people from across the globe cast their votes via the Internet between June and October 2005 for this year's World Mayor Award in accordance with the nominees' contribution tothe welfare of the city and their dedication and efficiency to meet the needs of the citizens. 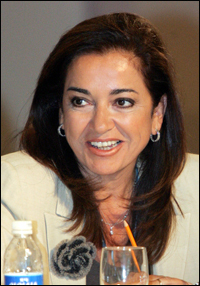 Bakoyannis won the support of over 7,500 voters, the statement said. This annual competition aims to raise the profile of mayors worldwide and back demands to give municipal governments increased power and authority, it added. The City Mayors project has become a comprehensive Internet (non-commercial and independent) platform dealing with the issues facing the world's cities. It examines how city mayors develop innovative solutions to long-standing urban problems such as housing, transport, education and employment, but also how they meet the latest environmental, technological, social and security challenges which affect the well-being of their citizens. Greater Athens has a population of about 4 million people, while the City of Athens has fewer than 1 million residents.